The glory of Istanbul’s Ottoman architecture and colourful carpets is arguably matched by its exotic, flavoursome foods. 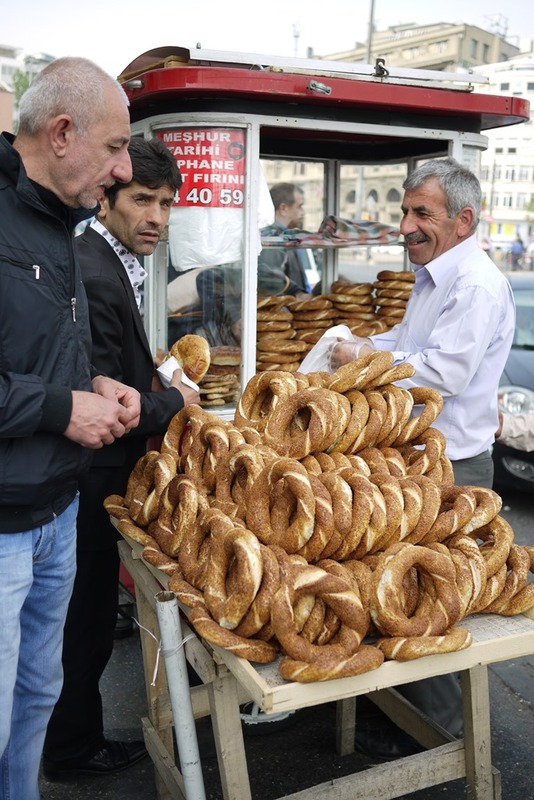 After three months of travelling around Northern Europe on budget-conscious cold sandwiches and greasy pub meals, I was delighted to arrive in Istanbul where fresh, delicious food is cheap, abundant and comes with a side of culture. Fast-forward a month of dedicated taste-bud travelling, and here you have my favourite Istanbul meals costing only 10 Turkish lira (TRY) each or less (that’s a meal for about €4). With its wholesome, traditional meals at about 4 TRY, this was my favourite place to eat in Istanbul. Cross-stitched flowers sprout on white cotton curtains, cafeteria-style tables sit in a charmingly plain room and a dumb waiter ferries to and from the mysterious downstairs kitchen. Find a menu (piece of paper in a plastic slip). If there are none, go downstairs and say ‘pardon, menu luften’ (excuse me, menu please). Interpret Turkish to pick your meal. This is a bit of a lucky-dip game but remember that yufka = rolled flat bread, kofte = meatballs, tuvuk = chicken, patates = potatoes, pilav = rice, bulgur = type of wheat pasta / rice thing, kulu kola = coke, su = water. Take a square of scrap paper and a pencil from the basket on the bench and scribe your order. The meals are not large and are cheap, so order a couple per person. If there is no staff upstairs, take your order to the kitchen and hand it to someone. When the little food elevator (a.k.a dumb waiter) appears soon after, try to guess if the meals are yours. Take your food, grab some cutlery and dig in. When you’re done, stack your plates in the empty little elevator. To pay, go downstairs again and say ‘pardon, hesap luften’ (excuse me, bill please), hope they remember you/ your order so you don’t have to explain and then pay. It’s that easy! It’s only a 50 metre walk off Istiklal Caddesi and yet it seems worlds away from the commercial madness of Taksim. This is a local favourite, especially with budget-conscious students. The cafe is in Öğüt Sok, in Taksim. Just turn at right at the mosque when walking on Istiklal from Taksim Square, take the second right and look for the cross-stitched curtains on your left. I’m always looking for the eateries that are loved by locals, so I was pretty excited when I wandered across this little lunch bar. 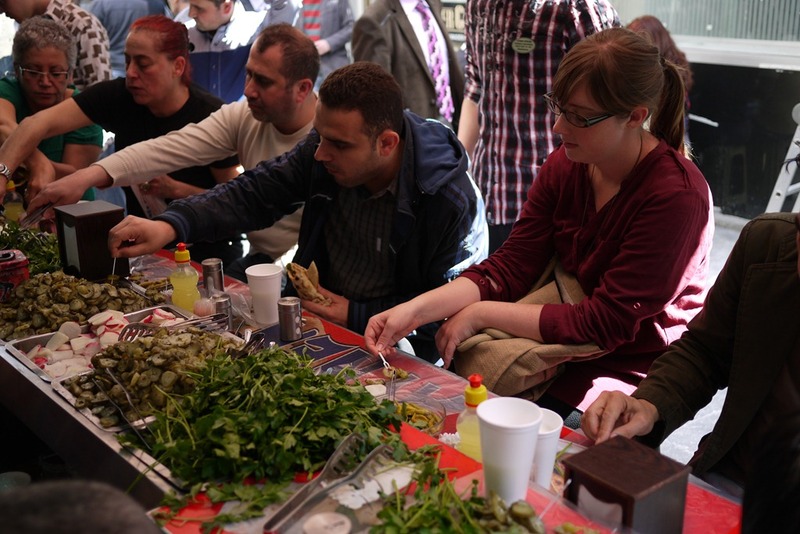 For the bargain price of 6TRY, you can sit amongst the outer bazaar buzz and help yourself to unlimited salad (fresh parsley, radish, pickled gherkins, tomato and spices) to add to your chicken roll. You can also enjoy the comedic hustle and bustle around you, as half a dozen boys clear spots, allocate stools, and run orders for Grand Bazaar vendors; a really fun lunch. Admittedly, I was lost in the bazaar maze before I found this place but that’s half the fun. I can tell you that if you enter the bazaar from the Sultanahmet side, walk down the outside wall of the bazaar and then turn left, you’ll find it in that general area with a bunch of other locally-loved cafes. Good luck! 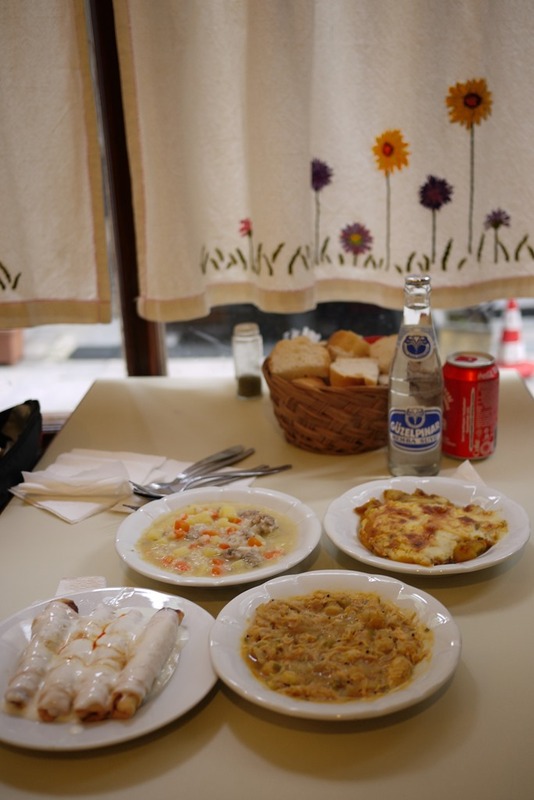 This Turkish meal is famous world ‘round for being a novelty and a deliciously cheap feed. Lining the docks of Eminönü, across from the New Mosque and Spice Bazaar in the Old Town, you’ll find rocking boats with barbeques frying fresh fish as fast as they can, before swinging them over in sandwiches to the throng of hungry locals. For the bargain price of 5TRY, you get a bread roll with a fish fillet (no batter, no crumbs), lettuce and onion. On the tables there is free salt and lemon juice to add. 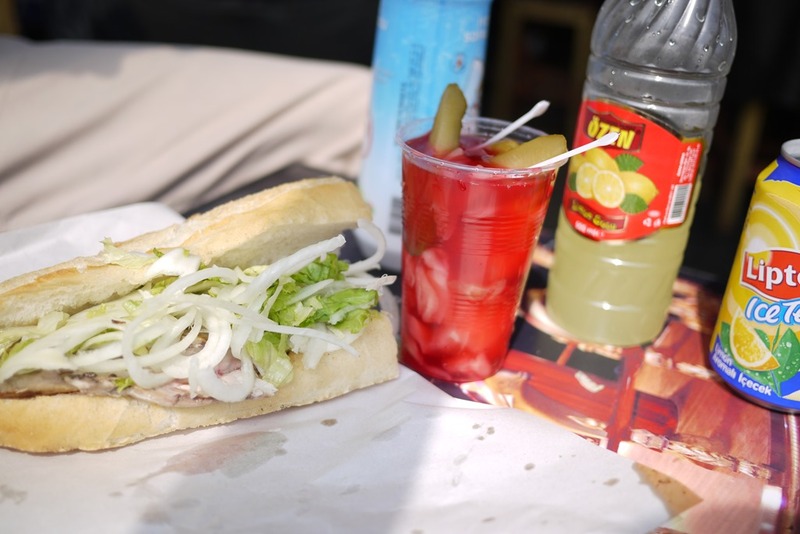 To make the meal complete, hail down one of the boys selling punch-red cups of pickles for only 1.50TRY, and grab a cold can of soft drink for 2TRY. The combination of flavours and atmosphere is worth much more than your 9.50TRY. This is best as a lunch meal, when you can sit in the sun and watch workers by the scores duck in, gobble their fish bread and leave just as quickly. Also, quick tip: if you care for clean hands and a bit of peace, buy a 1TRY packet of fruit-scented wet wipes and leave them strategically placed on the table to ward off the constant wave of young vendors. It’s quick, it’s cheap and it’s a local lunchtime favourite: dürüm tavuk is a chicken kebab roll made with doughy flat bread, chips, chicken shaved from the spit and some lettuce. For 4.50 TRY you can get a roll. Add a couple of liras for the common local drink, Ayran, which is basically runny natural yogurt, and you’ve got yourself a meal. You can get it, and dürüm et (lamb equivalent) almost anywhere in Istanbul but there are a cluster of cafes across from Galatasary School on Istiklal Caddesi, (the main shopping strip in Taksim), where you can grab a seat on the third floor and watch the crowds do their crazy thing. On Sunday afternoon, the trendy Istanbul suburb of Ortaköy is thriving. Markets of books, art, jewellery and crafts crowd the public square on the European shore of the mighty Bosphorus. The only thing that can improve the boat-watching, bird-feeding, holiday vibe is devouring one of the locally-adored baked potatoes. For 7.50 TRY you can have a baked potato with butter and cheese, or for 10 TRY you can have a baked potato with the works. 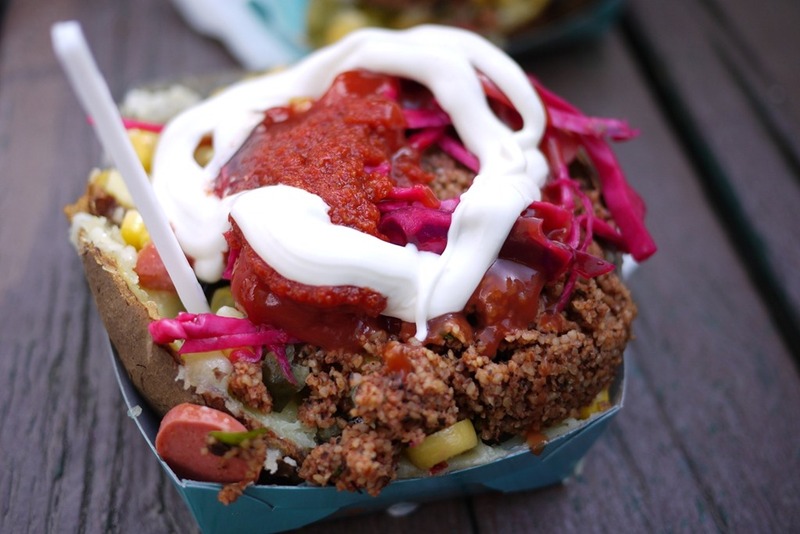 By time you’ve carved out the delicious insides of your spud, you’ll be looking full and content – like everyone else in the square. Simit – circular bread rolls for about 1TRY each. Barbeque roasted chestnuts – a bag is a couple of TRY, no need to peel. Pick a vendor with a high rotation. Charred corn cobbs – for a couple of TRY. These are either delicious or cold and dry, so pick wisely. All manner of nuts – prices vary but only a few TRY for a little bag. Freshly squeezed citrus juice – only 1TRY for a cup. Pinapple on a stick – a wedge will be 1TRY per stick. So, you’ve got two options here (I say try both). The first is to haul yourself up five storeys of stairs to the Mado terrace in Taksim and enjoy a well-earnt bowl of the sticky Turkish ice-cream, choosing from multiple Turkish flavours available (like pistachio, pomegranate, honey, or sade, which is like ‘plain’, not vanilla). A bowl with four flavours will set you back only 7TRY. 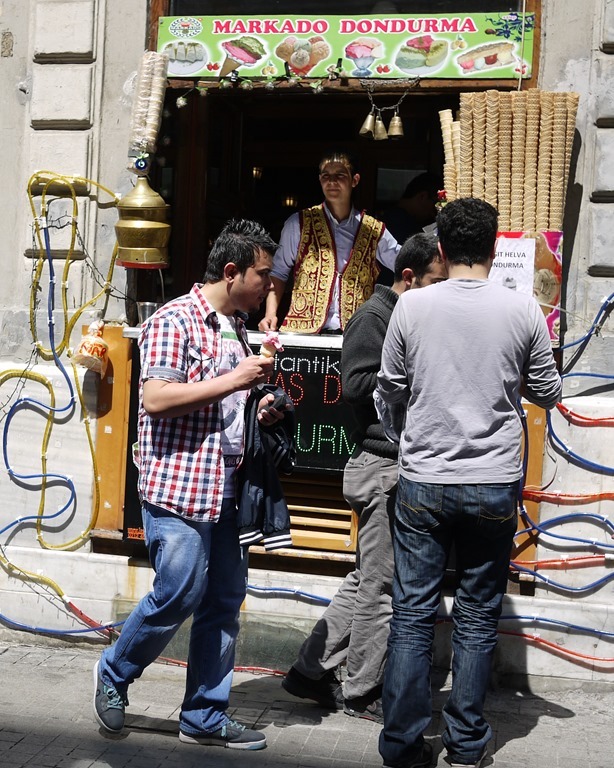 The second option, is to enjoy dessert within the madness of Istiklal Caddesi by ordering an ice-cream from one of the many street vendors in their traditional dress and with their swirling ice-cream sticks. This will only set you back a few liras and comes with a bell ringing show. P.S. For a meal at the opposite end of the budget scale, treat yourself to a booking at 360 Istanbul in Taksim. 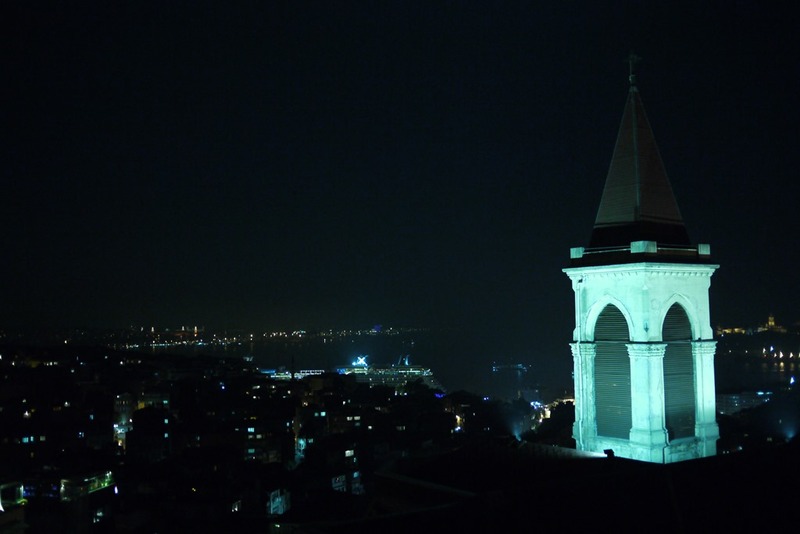 As the name suggests, this modern, trendy restaurant has amazing panoramic views over the Old Town and Marmara coast that allow you to admire the glowing minarets of the mosque-dotted skyline. It serves pricey but interesting and good value meals (at our table there was a chilli-chocolate beef steak, slow cooked cherry duck and grilled sea bass). We were also treated to an unexpected aerial fabric acrobatics show that had a cheeky burlesque edge. Seatings are in two hour slots, bookings are essential, and after midnight 360 turns into a nightclub with fire-twirling dancers and other such delights. Meals are 30-50TRY, a bottle of wine is 80-100TRY and the club has a cover fee. 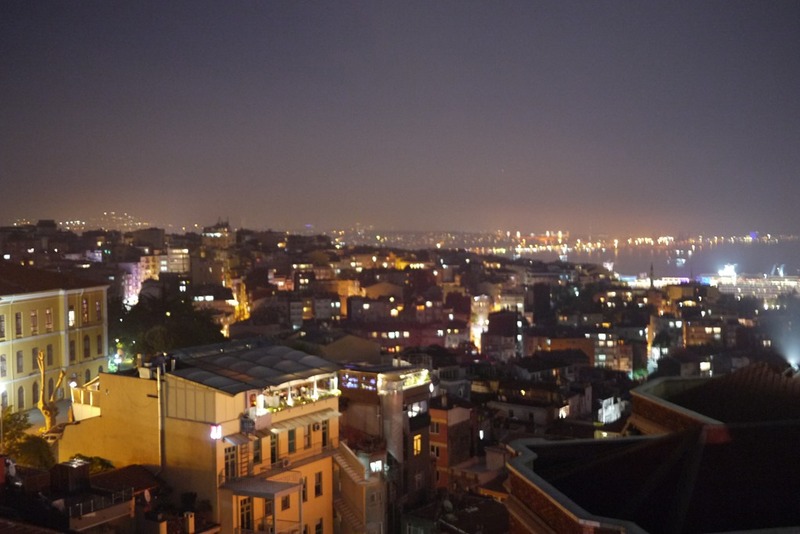 A warm thanks to my Istanbul friends – Gulsah for showing us Mevki (we kept going back) and Nilüfer for sharing her wealth of local knowledge and a great meal at 360. Your company and insights were a pleasure. Gosh Nic, you’ve really done your …um…”research” well. I want you as my guide next time we go to Istanbul! Thanks Dacsmax, I try 🙂 One of my favourite things about travelling is trying new cusines, learning about new cultures, especially when it’s within budget. During the fasting month in Singapore, a Turkish guy will come to sell ice cream. That will happen in a few months’ time, which means I look forward to this once-in-a-year ‘event’! You’re lucky to be there babe! So glad you enjoyed it Audrey, thanks again for reading. I’ve found myself exploring most places via my stomach. Keep an eye out for my Spain foody photos and my Barcelona post about amazing market eats. I hope you are enjoying your first few days in Istanbul Tasaduq! How exciting. Please do let me know what you think of the megatropolis. Istanbul Simply a beautiful place to be. With nice people ,places and things to see!Will be there on this 26 Oct will definitely hunt for food. Been there many times before but for antiques and antiquarian . Thanks for the tip Nic.